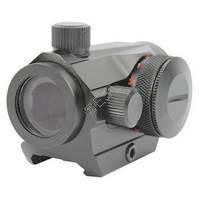 This style of sight is often referred to as a 'Red Dot Sight' and most of them do use a red dot but some are green or can even be switched back and forth between the two colors depending on your preference. 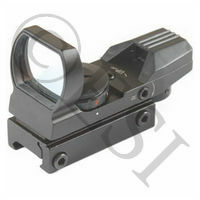 A dot sight is a non-magnifying reflector sight used for firearms, paintball, airsoft, and other shooting sports. The dot is seen only in the sight. It is not a laser and does project on to your target. The visible dot is generated by light-emitting diode (LED). They do need a battery for power but the batteries last a long time because the LEDs are so efficient. 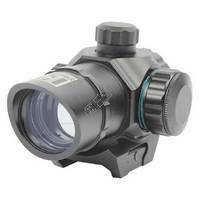 Because dot sights are not magnified and the light you're seeing from the LED is collimated you don't have to worry about eye relief. You can view the dot reticle and target easily without keeping your eye glued to the sight. 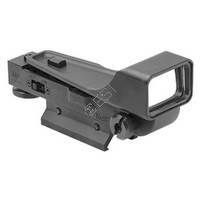 This is great for any firing platform that has recoil so you don't jam the sight in your eye when firing. 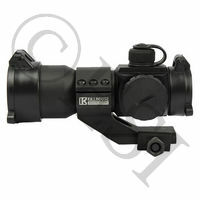 These sights work great for paintball too because you can view them perfectly fine with your mask on. For more in depth product specifications check the individual product page, along with our buying guide at the bottom of this page. 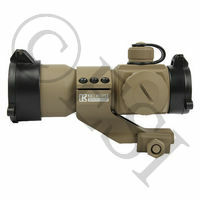 A mini, yet durable dot sight. . Tapering brightness setting. 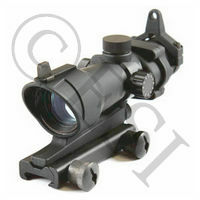 Acog style dot sight. Only weights 4.1 ounces. . Your choice of two reticle colors. Aim fast, aim accurately. 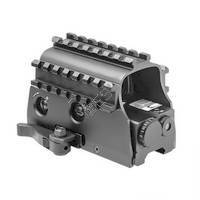 Make sure you can do that by upgrading to a Red Dot Reflex sight like this one!
. Green dot sight. Mounts to weaver rails. Green dot sight, adjustable brightness settings. Weaver or Picatinny compatible. This is referring to the reticles (or dot) color. Most are red, while some may be green. 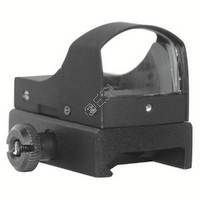 Some dot sights have the ability to switch between colors with just a turn of a knob. Having different colors to choose from can be very beneficial. For instance if you&rsquo;re playing in a dark environment the red dot may show up better for you, or vice versa. Most dot sights have different brightness setttings, making it easier to see your sight based on the lighting and terrain you are playing in. This will tell you how many different reticle brightness settings the dot sight can adjust to. 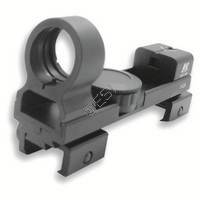 Nearly all of the sights we have here at TippmannParts.com are red dot sights, meaning the reticle will in fact be a dot. However we also have sniper style scopes that will have crosshairs. 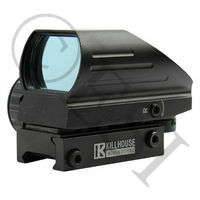 Some of our more complex sights may even have custom reticles such as triangles, x&rsquo;s, or even zombie related reticles. Mount length is going to refer to the length of the mounting pieces. This information is important because you need to make sure you have adequate room on your markers rail. If the mount length is 3 inches, but if you only have a one inch rail on your marker then the dot sight will not mount properly. This measurement is used to give you an idea if this scope is going to be a good size for your marker. We measure from the bottom of the rail mount up to the highest point on the sight for the height, and we measure from the back of the sight to the front for the length. If you are worried as to whether the scope will fit with your hopper these are good measurements to know. There are two different types of body styles. The tubed version will be more durable as they have a more bulky body, also tubed styles will have fewer reflections. Another advantage of the tubed style sights are that the led light is inside the tube, keeping it safe. Open styles will be less bulky and more for the close quarter combat player. We find this measurement by taking the diameter of the lens. This will give you a better idea as to the size of the sight. Simply how much the dot sight and its rail attachment weigh.